The point of this little story is we have this happy-go-lucky 5-year-old previously getting along in her world without any awareness that her left eye had the most common form of reversible blindness (that affects 1 in 50) children, known as amblyopia. Before this news, Kaitlin could do all the things the other kids could do. Play on the play ground, chase a soccer ball, color in her coloring books and even was beginning to learn how to recognize letters. But, now she is being faced with a prescription for treatment that will throw her “normal world” upside down for 2-6 hours a day. A treatment that has been taught all eye doctors and research has shown can be effective for patients as long as they comply with the treatment protocol. After all, how hard can it be to wear an eye patch for 2-6 hours per day for 6 months to a year? No problem right? Well, just in case you would like to find out, allow me to suggest this simple experiment. But first, a word of warning, before you attempt, do not try this while driving a vehicle or operating machinery. To start, if you wear corrective lenses begin by smearing some oil or other similar substance on both lenses to make them foggy. Then take some adhesive tape and cover one of the lenses to that it is completely occluded. Now put on your glasses and look around your environment. Try something simple like watching TV from a chair. Next get up and move about the room… but don’t try a stairway! Tired of that, well then sit down again and reach for a newspaper, magazine or book and try to read. Take a pen and paper and make a list of what you can see in the room. How does this make you feel? Anxious, frustrated, uneasy, off balance? Now imagine you are 5 years old and just learning how to read or write. You used to like to run around out doors and chase a soccer ball but now it is so much more difficult. You want to rip off the patch, but now imagine that your parents taped the patch on your skin so that you could not remove it. What type of emotional toll would this have on you? Therefore, the research agrees with what you probably experienced if you tried my previously suggested occlusion therapy simulation. Patching is stressful! Stressful to the young child and to the parents. And yet, what parents and the public needs to know is that occlusion therapy, when done alone, is no longer the standard of care.Yes, evidence based research shows that a binocular vision therapy approach is a more effective treatment for amblyopia vs occlusion only therapy. Plus, because it does not rely on having the child wear an eye patch for 2-6 hours a day, the negative psychosocial and emotional side effects are eliminated. So when you hear eye patching for amblyopia think the Ford 1912 Model-T automobile. Known as one of the first successful automobiles produced nearly 100 years ago. But for today, well It might get you to your destination or it might break down. And it surely won’t be a comfortable ride. On the other hand, binocular vision therapy is like the 2012 Ford Focus. A car of today using the latest technology to make your ride is safe, reliable and comfortable. Plus, you might have some fun long the way! 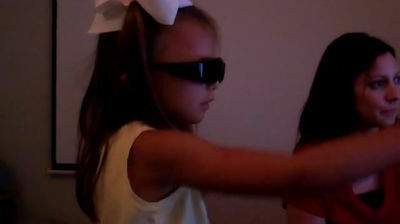 In this video you will see an example of binocular office-based optometric vision therapy that utilizes the latest technology you will see our young patient experiencing binocular stimulation in an activity that uses 3-D technology on the VTS-4. This and many other examples are part of a comprehensive binocular vision approach for treatment of amblyopia that yields the best outcomes without the unwanted emotional stress of occlusion therapy. You you can find more articles on amblyopia compiled in the VisionHelp Category Cloud “Amblyopia” or click here. To find a doctor who provides office based optometric vision therapy including binocular vision therapy for amblyopia, go to www.covd.org and click on “Locate a Doctor”. Share the post "The psychosocial and emotional consequences of occlusion therapy….an antiquated treatment for amblyopia"